← Larry Nelson’s first Engine run for his Zenith 601. How tough are Corvair engines? Below, two photos of damage inside core engines from running cars (not aircraft). The top was a motor run without oil, and one with finger tight rod nuts, the bottom was run with the belt off the cooling fan. The damage shown in the pictures didn’t happen in a second, nor in a minute either, and the engines still ran, very poorly, but they were not locked up. Over the years I have seen perhaps a 1,000 core motors, and very few of them had this kind of issue, almost all of them were simply worn or tired, but still capable of running acceptably when the car was parked. The major problem that makes some core motors unusable is being stored outdoors and getting water inside. You can check this easily when looking at a core engine by making sure it rotates 360 degrees before buying it. Ones that have had water inside, will not turn. The examples below are from cars, but I have plenty aircraft examples also; An engine run for 11 minutes turning a prop at 2,200 rpm (about 45 hp) without any oil in it. It stopped but only did $700 in damage; The guy who’s ‘local expert’ set the timing for him, but thought the 0-8-16 timing marks were 0-3-6, so he set the timing for about 60 degrees advance, which blew out 3 head gaskets. the static rpm dropped from 2,700 to 2,000 rpm but the builder actually flew it 2 more times because he had a long paved runway at his airport; the 30,000 hr airline pilot who flew a cross country with a bad enough oil leak that the pressure went to zero, twice, and he felt comfortable adding a “quart or two” and proceeding. This doesn’t even touch on the several dozen people who damaged engines by never setting the timing, but thought they were getting away with it because their engine didn’t stop abruptly, it just tolerated the blown head gaskets and broken rings without quitting. The list is endless, but let it be said that the intelligent Corvair builder has a very robust engine to work with. 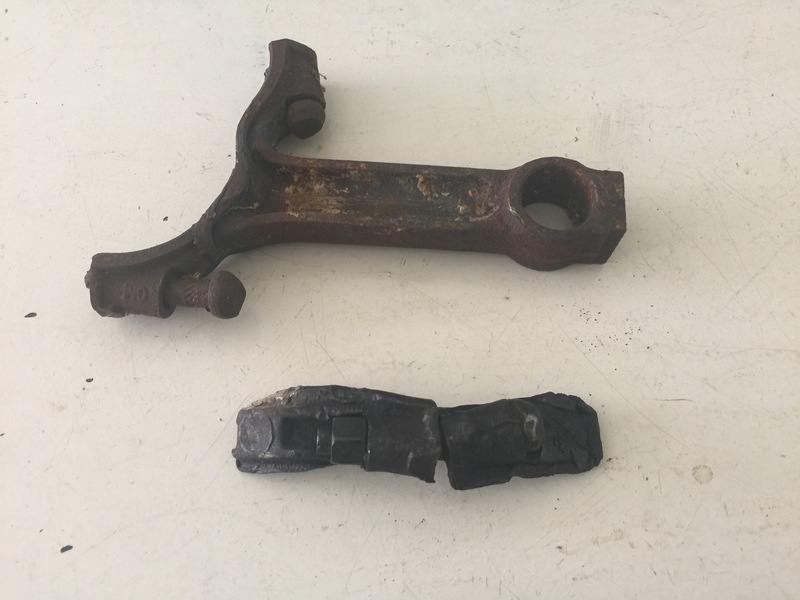 Above, two rods from car engines; the bottom was run for more than 10 miles with no oil in it. Notice that the rod bolt and nut are still intact. The bearing melted, and took out the rod, but the motor did not stop, the driver just reported it “made a lot of noise” on the drive back home. The top one was from the shop of a “race car builder” who rebuilt the engine and it lasted long enough to leave his shop, where he claimed no further responsibility. Without question, the “race car builder” forgot to torque the rod nuts on these bolts. The driver reported it ran poorly, but he drove it around for a while that way. The piston was just jammed at the top of the bore, and the engine kept going. Damage tolerance isn’t a primary engine selection criterion in experimental aircraft, the way it was when the US Navy specified that it would only accept air-cooled radials for combat service in WWII. Many newer engines cease to run the first moment any small piece of material gets loose in the engine, but the Corvair has more in common with the damage tolerance of radials than it does with modern engines. The majority of the general public when looking at photos like these will say “I would prefer to have an engine that will never break” much the same way that children have a decided preference for unicorns despite a historic supply problem that suggests the perfect engine and the unicorn will be delivered on the same day hell freezes over. For people into a higher level of discussion, I can point out the design features of the Corvair that give it an extraordinary resistance to stopping when damaged. First and foremost, go look at your core engine and see that the cam and crank timing gears, the only part of the engine where a chip of metal can not be allowed to pass, live in their own part of the crankcase, and don’t share the same compartment with the rest of the parts in the case. There are many other elements, like forged components which are not brittle, and particularly being air-cooled and having no possibility of loosing coolant into the engine, etc. If you like machines, it is a very interesting study. Above, a core engine that came to our shop in 2005, from a person who drove their Corvair for a week with no cooling fan belt on it. Both the valve seats in the above cylinder have been beaten into the ports and broken up, yet the engine continued to run on the other bank of cylinders. Notice that neither valve head come off the stem. The rusty bits imbedded in the head are broken up valve seat. While your engine will obviously never look like this inside, it is a very desirable characteristic of aircraft engines that they be able to sustain some damage without complete failure. The next time somebody points out to you that a Corvair engine is slightly heavier than a VW, Jabbaru or Rotax, tell them that you accept this because there are robust qualities to the Corvair that you appreciate. 2 Responses to How tough are Corvair engines? Robust indeed; reminiscent of the old Timex ad, ” takes a beating and keeps on ticking”. I guess “super duty” is an apt description.